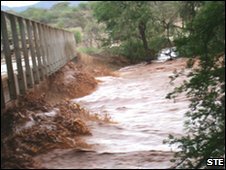 Flash floods have washed away a major scientific research centre used to study Africa's wild elephants. 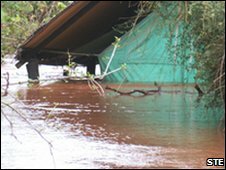 This morning, flooding of the Ewaso Ng'iro River destroyed the research facility and associated camp located in Samburu National Reserve, Kenya. The centre has unveiled pioneering insights into elephant behaviour, including how fences made from beehives can deter elephants from raiding farms. No-one is reported hurt but valuable research and data has been lost. As well as the Save the Elephants (STE) research facility and Elephant Watch Safari Camp located in Samburu National Reserve, seven other neighbouring lodges were completely destroyed. Beds, tents, computers and vital research documentation were submerged in mud and strung up in the treetops. Over 200 people watched from a hill above the camps as the waters wrecked havoc, say STE organisers. The flash floods appear to have been triggered by the start of Kenya's rainy season. Although it is too early to asses the cost of the damage, STE operations manager Ms Lucy King, who is also studying at the University of Oxford, UK expects it will cost hundreds of thousands of dollars to rebuild the facility. Last year, a pilot study conducted by Ms King and colleagues showed how a simple fence made from wood, wire and beehives can deter elephants from raiding farmers' crops. Such fences reduce the number of raids by elephants by almost half, the researchers found. The work was the culmination of previous research which showed elephants are naturally scared of African honey bees. Other research conducted at the facility includes a pioneering animal tracking project that uses using mobile phone technology to follow the movements of African elephants. The camp was also used a base for filming the BBC natural history documentary The Secret Life of Elephants, first broadcast last year. Do speedy elephants walk or run?